Amazingly, such power and productivity arose from a time of crisis in America: the years of the Great Depression. During the depression, the unemployed traveled across America to find work building this dam. Southern Nevada became home to workers from forty-seven states, and out of this national suffering came what was to be known for a decade as the tallest dam and the largest hydroelectric plant in the world. Something good happened in the USA in a time of bad news and suffering. Our text this morning offers Christians a glimpse of God’s great power and work in a time of suffering. Israel has been exiled to Babylon. Jerusalem had been besieged, her walls torn down, and her temple destroyed. Out of this suffering comes a voice of lament, the Book of Lamentations. And in the center of this book is a revelation of the amazing faithfulness of God. This morning, as we look at this text, we will consider God’s great faithfulness that we might have hope in our times of suffering. God’s Faithfulness Is Great and Fills Our Lives with Hope. If you have ever been to a funeral, you know that every funeral is different. Grief has many voices, it is expressed in many ways. The same is true in Scripture. Today we hear from the Book of Lamentations. This book contains five laments, and each one is different. Our text is part of the third lament. This third lament is personal. It’s the cry of a man who has seen suffering (3:1), the suffering of the exile and God’s judgment upon His people. Having seen these things, this man is grieving. In his lament, he is speaking about God. Note that. He speaks about God rather than to Him. And things are going so badly for him he sees God as the problem. He thinks God is one hiding in the bushes like a “bear lying in wait” or “a lion in hiding” (3:10). He thinks God is an archer who shot him with His arrows in the back, in his kidneys (3:13). This doesn’t sound good, does it? This man has experienced the judgment of God and reached the point where he has hit rock bottom and his hope from the Lord is gone. He can’t speak to God. He can only speak about him. Looking at God through the lens of his life, seeing God through the experience of suffering, he is no longer able to pray. What’s the point? God hates him, or so he thinks. But then in these passages, the man remembers something. Well, actually, someone. He remembers God. He remembers God’s faithfulness, God’s mercies, God’s steadfast love. God restores a relationship with this man. The Holy Spirit reminds the man of God’s Goodness. Suddenly, the man is speaking to God rather than about Him. In our text now, we hear the beginning of his prayer, the prayer of a person in relationship with God. The man says, “Great is your faithfulness” (v 23). Not great is God’s faithfulness. Great is your faithfulness. This God, who once delivered His people from slavery in Egypt, will deliver them from exile in Babylon. This God, who judged His people for their sin, will forgive them and bring restoration. In the face of great sin and great suffering, God’s faithfulness is great, a greatness His people can rely on. 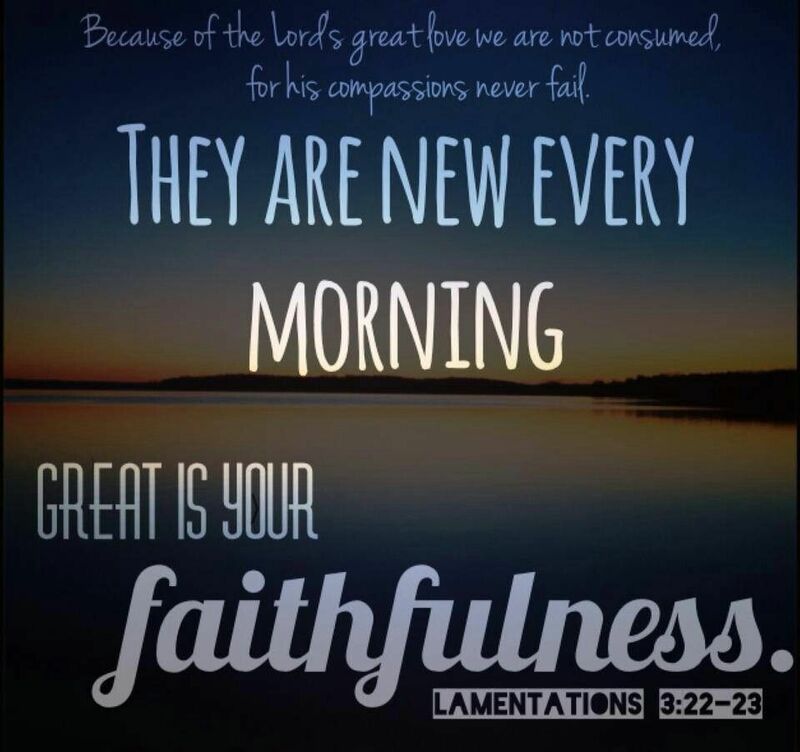 What is described in Lamentations happens all the time today. In our world, people sometimes use their life experiences as a way of determining and measuring God’s love. If God has delivered them from suffering, then God is powerful. If God has prospered their business or family, then God is loving. When things don’t go the way we want, when things don’t go according to plan, then it’s God’s fault. Our reading from Lamentations calls us to return to God. Rather than measure God according to our lives, we remember God according to His Word and His promises, and His promises never fail. As the text says, “For the Lord will not cast off forever, but,….he will have compassion according to the abundance of his steadfast love” (vv 31–32). Of all people, we know about the “steadfast” love of our God. In the life, death, and resurrection of Jesus, God has shown us His everlasting love. There on the cross, God revealed His love, once for all time. Using a Roman instrument of torture, God showed His love for us unlike any other way in history. His love is so great that He took the judgment of our sin on Himself for us. His love is so great that He promises eternal life to us. After this man remembers God’s faithfulness, suddenly he begins to live in hope. Now, his soul is full. Full of the promises of God. “The Lord is my portion,” he says (v 24). That’s kind of a funny word there: portion. Normally, those of us who are watching our weight will use this word when it comes to figuring out how much we will eat. In Old Testament times, a portion was something you got after a victory in battle. After fighting, the spoils of war were divided, and each warrior received his “portion”. This time, however, the Lord has fought for him. The Lord has fought, and the Lord has won. And now the Lord chooses to give Himself as a portion to His people. They don’t receive the winnings from the battle but instead, they get the One who won the battle. The Lord is their portion. Is it any wonder that this man’s language suddenly bursts with hope? Even in the middle of all the bad news he is seeing and dealing with, this man speaks of God’s goodness. Because God is good (v 25), life is good (vv 26–27). Life in the middle of an exile and suffering? Yes, even there God’s faithfulness is great and he lives in hope. While in this world, we have suffering. But in the midst of suffering, we have hope. There is no suffering we deal with that Jesus has not already overcome. And like the guy in our text, we will return home from our exile. You know where I am going with this right? And no, this is not a lead into a story about my flight back from Germany. We are in exile. We are not meant to live in this world of sin. Jesus has defeated sin, and when He returns, He will take us from this land of our exile to our home…our REAL home…our FOREVER home…in HEAVEN. That is the hope we have when things are not going our way. Our hope, because of the death and resurrection of Jesus, our Hope, our Joy is that Heaven is our home. We wrap up. On the floor of the Hoover Dam, there is what is called a celestial map. This map remembers the day that President Roosevelt dedicated the dam. Rather than just giving the date, it gives the configuration of the stars on that day. The designers of the dam thought their project was so great and so daring that they needed a special way to let future generations know when that thing was built. According to astronomers, the celestial map will allow people to date the dedication for the next fourteen thousand years. This morning, God has given us the promise of His faithfulness. It can be seen by all the faithful believers, not by looking at the stars but by looking at a cross. There, outside the city of Jerusalem, God the Father condemned His only Son to death that He might eliminate the sins of the entire world. Now, risen from the dead, Jesus Christ proclaims God’s love to you and to everybody. God’s faithfulness is great. It is great in its power to forgive you your sins. It is great in its extent, lasting from generation to generation. And it gives our lives hope until Jesus Christ returns to take us home from our exile.